This is a minimally invasive procedure requiring a general anaesthetic. Splenectomy is an operation performed to remove your spleen an organ that normally sits in the upper left part of your abdomen. 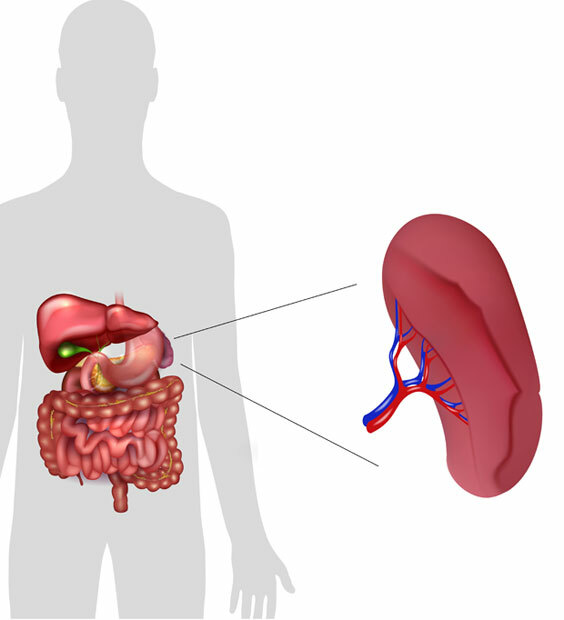 In a planned situation a spleen is removed when it has become very large causing symptoms of pain or fullness or when other treatments have failed to control the symptoms of certain blood disorders. The operation takes place through small incisions on your abdomen, 0.5-1cm typical size, through which gas is inflated in order to create space and make internal organs easy to see. A tiny camera (laparoscope) is then inserted into the abdomen guiding the insertion of further specialised laparoscopic instruments which are used to release the spleen from all of its attachments and blood supply. One of the functions of the spleen is to protect the body from certain types of bacterial infections. Removal of the spleen will therefore predispose you to those infections for the rest of your life. It is therefore recommended that if you are to undergo a splenectomy to be vaccinated against those infections at least 4-6 weeks prior to your procedure otherwise this will need to be performed 2 weeks after your surgery. Furthermore, you may need to have a transfusion prior to your surgery and stop any medication affecting your immune system. After the procedure you will wake up in a hospital room. Laparoscopic splenectomy is normally performed as a day case operation but sometimes patients may need to spend a night in hospital. You are typically expected to go home once you are eating and drinking, are able to manage the pain and walk unaided. Because of the risk of infection following your splenectomy you will need to take antibiotic tablets for at least 2 years following your operation and depending on your general health and age these may need to be continued indefinitely. Furthermore, as the spleen is the site where platelets are removed from the circulation removal of the spleen may lead to a significant increase in the count of platelets in your body which may increase your risk of developing a blood clot. Your platelet levels will therefore be monitored following surgery and if the level of platelets becomes too high you will be prescribed some aspirin to reduce the risk of clotting. It normally takes two weeks to fully recover from a laparoscopic spleenectomy and return back to work but it varies from person to person and depends on their general health and the nature of their work. You should avoid any heavy object lifting or strenuous exercise for at least 6 weeks to reduce the risk of the hernia coming back. The risk of complications from a laparoscopic splenectomy include those common to all surgical procedures such as infection, bleeding, blood clots, heart problems, pneumonia, urinary retention and anaesthetic risks. Complications specific to this operation include a risk of injury to the stomach, pancreas or colon as well as a small risk of needing to perform an open operation.